In this guide we’ll look at the best telescopic ladders. What Is The Best Telescopic Ladder? This Finether 3.8M Aluminium Telescopic Ladder extends up to 3.8 metres (12.5 ft) and has a weight capacity of 150kg. It is constructed from aluminium alloy which makes it sturdy and rust resistant, yet lightweight. The ladder can be adjusted to any height required from 33 inches to the full extent in 1-foot increments simply and easily. It easily packs down to 47 cm × 8 cm × 84 cm for convenient storage and transportation. At only 10.2 kg, this ladder is light enough to move around easily without the difficult manoeuvring required with traditional ladders. It is also perfect for use in confined spaces as you only extend it as far as you need. This ladder is the best telescopic ladder because it is safe, portable, easy to use and highly functional. This telescopic ladder also features a heavy duty strap to secure it firmly, a sturdy stabilizer bar and plastic bottom caps to prevent slipping and tipping. It is fully tested in accordance with BS EN131. The package also includes free protective gloves and a case to store the ladder in. This telescopic ladder is incredibly safe and sturdy to use and is ideal for a versatile range of household jobs such as cleaning, painting or accessing the loft space. This is the best telescopic ladder available for the UK market. This Nestling Multi-Purpose Aluminium Telescopic Ladder comes in a range of sizes from 2.6 to 3.8 maximum heights. It is constructed from aluminium for lightness and strength. The mechanism is easy to use and gives full flexibility in how much you want to extend it as it is adjustable one step at a time. The legs feature black plastic end caps on the feet to prevent slipping and tipping and a sturdy bar to stabilize it. The unit packs down to a convenient size and is light enough to easily carry and transport. This ladder is sturdy to use and also lightweight and easy to manoeuvre. Its compact size makes it easy to store and it is versatile enough for a range of tasks such as cleaning and painting. If you are looking for the best telescopic ladder, this is an excellent quality product that won’t let you down! This Youngmans 3.3 Metre Aluminium Telescopic Ladder extends to 3.3 metres (10.8 feet) and is very sturdy. The ladder features automatic locking and release for ultimate safety. The ladder can be extended from rung to rung and has nice wide treads and slip-resistant rungs which feel safe and comfortable to use. The item is constructed from aluminium alloy making it sturdy and rust resistant. The ladder has a load capacity of 150 kg, folds down to a length of 0.78 metres and weighs 11.4 kilos making it light and compact enough to store in a cupboard or fit in the boot of a car. It has been fully tested in accordance with BS EN131. This ladder is super sturdy to use and the wide, slip resistant rungs feel comfortable and secure. Much like all the best telescopic ladders, this is very safe and sturdy to use in operation. Telescopic ladders are a convenient addition to the home or workplace. 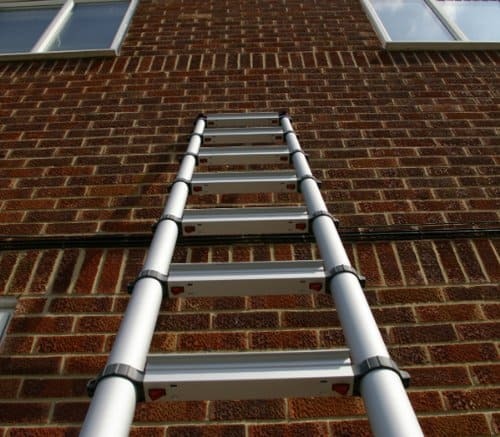 The best telescopic ladder is perfect for accessing difficult areas such as lofts, as well as for minor household jobs such as cleaning windows and gutters or painting high ceilings and hallways. The best telescopic ladders are lighter and easy to manoeuvre than traditional ladders – yet many can extend to up to 5 metres. They also pack down very small making it easy to store them in a cupboard or under a bed and they can even be fitted into the boot of a car. Telescopic ladders are really useful and convenient, however, as with all ladders, they must be used with care to ensure safety. When looking for the best telescopic ladder you must ensure it meets the EN131 certification so that it complies with British law. Do not be tempted to buy a product that does not meet these standards as not all countries have such stringent tests. In addition, you will not be legally allowed to use the product on a work site without this standard. What makes the best telescopic ladder useful is its ability to extend rung by rung – it’s extremely versatile and easy to use in a wide range of situations. They also fold down very small which makes them easy to store and transport. You should take care when extending and lowering the mechanism as they can easily trap fingers and thumbs if not used carefully. Some models have anti finger jamming mechanisms to help prevent this. When looking for the best telescopic ladder you should check the maximum capacity of the ladder to ensure it is suitable for your jobs. Remember that the maximum load includes your weight as well as any tools and materials you may be carrying. If you are carrying very heavy materials, then a telescopic ladder is not the right tool for the job. You should also ensure that the product you choose has a stabiliser bar, which is a thick aluminium bar at the bottom of the ladder, which prevents the two legs bending away from each other. This provides extra stability and prevents the ladder from shaking and swaying, so you feel more secure when using it. You should also choose a ladder that has nice grippy feet to reduce the risk of slipping about on smooth or wet surfaces. How should I maintain my telescopic ladder? The best telescopic ladder is made of aluminium alloys which needs little in the way of care and maintenance. However, you should never leave your ladder out in the rain and if it gets wet you should wipe it down well before storing it in a dry place. You may also need to use a silicone spray to get the mechanisms completely dry before storing. To ensure the mechanism moves freely, us a dry cloth to apply a silicone-based furniture polish to the stiles of the ladder. This will leave a slightly waxy coating which will allow the mechanism to move smoothly. However, you should check the manual that came with your ladder for specific maintenance and cleaning advice. Can I use a telescopic ladder as a fire escape? How do I use a telescopic ladder safely? There are several safety precautions you should take when using a telescopic ladder. Always check the ladder before use to ensure nothing is damaged or broken and that the rungs are secure. Tie the ladder up or stabilise it against a solid surface before you climb it. Make sure that the ladder is at a safe angle, and that the feet are sufficiently braced. Never adjust the locking mechanisms while you’re on the ladder. Take care when extending and closing the ladder. If the ladder is closed too quickly it can trap your fingers as well as causing damage to the item.